Hello you lovely lot! Today’s post is going to be short and sweet. 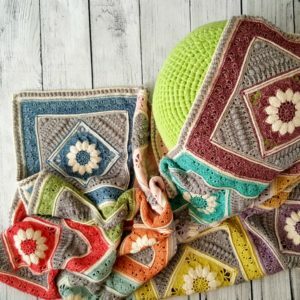 ‘Flowers for Lydia’ is a bigger version of the Lydia Square I used for Sophie’s Universe and the Lydia Blanket. If you have already seen the Lydia blanket, you will know what I have done. 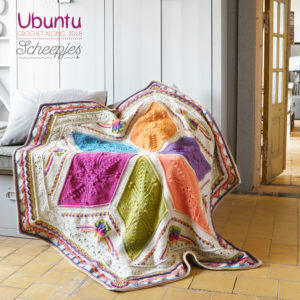 For those of you who haven’t seen the Lydia blanket, I am going to explain how to create this square. 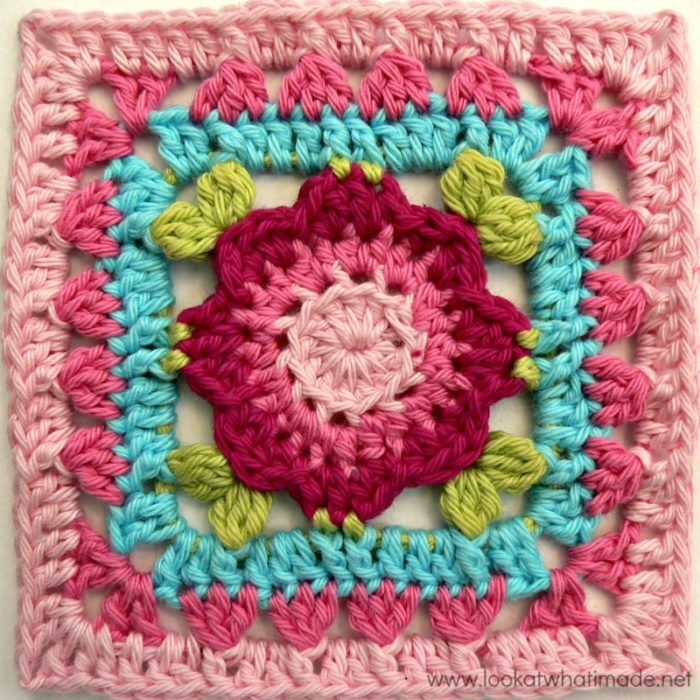 This square was made using Scheepjes Cotton 8 and a 3.25 mm crochet hook. It is 19 cm (7.5″) big. 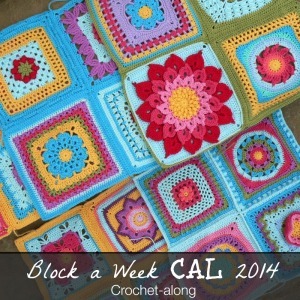 Using double knit yarn and a 4 mm crochet hook, your square will be approx. 25 cm (10″), depending on your gauge. 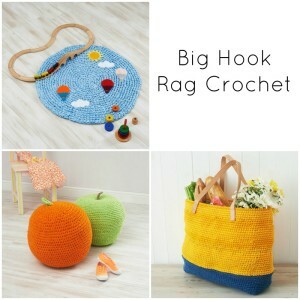 If you are using worsted weight yarn and a 5.5 mm crochet hook, your square should be 31 cm (just a smidge over 12″). 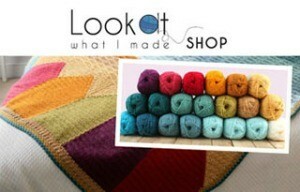 If you want to know more about the yarn and the colours I used, have a look at the Lydia Blanket pattern HERE. When I asked my lovely testers to test the Border for the Lydia Blanket, I asked them to use one Lydia square and just add the border to that, seeing that the final round stitch count for the square was exactly right for starting Round 1 of the border. 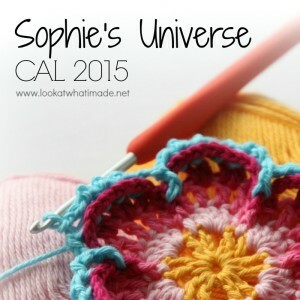 The resulting square was so cute that I had to make one myself and share it with you. 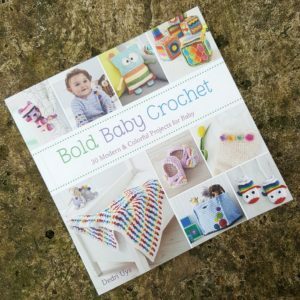 The first thing you will need to do is make one Lydia Square using THIS PATTERN. 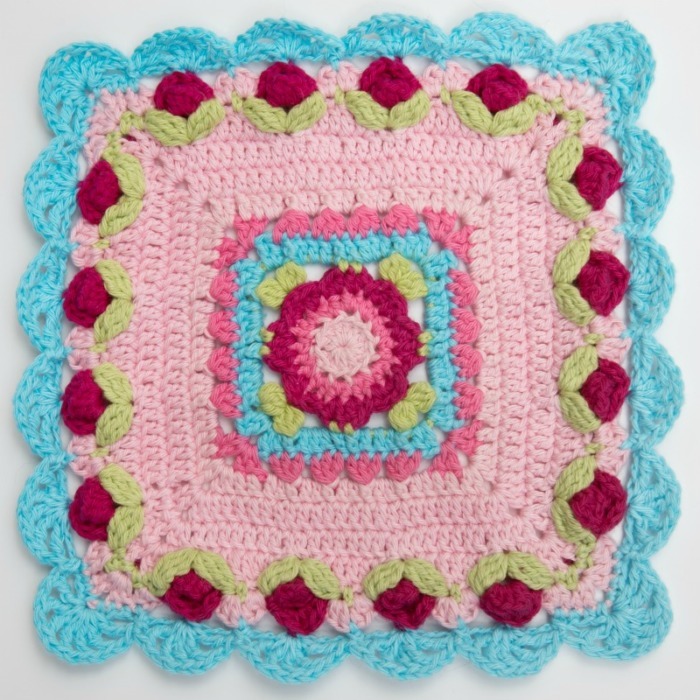 Once you have made the square, you will need to add the Rose Border using THIS TUTORIAL. Remember to go up a hook size on the last round so that your scallops lie nice and flat. The last round of the ‘Flowers for Lydia’ square is quite lacy. 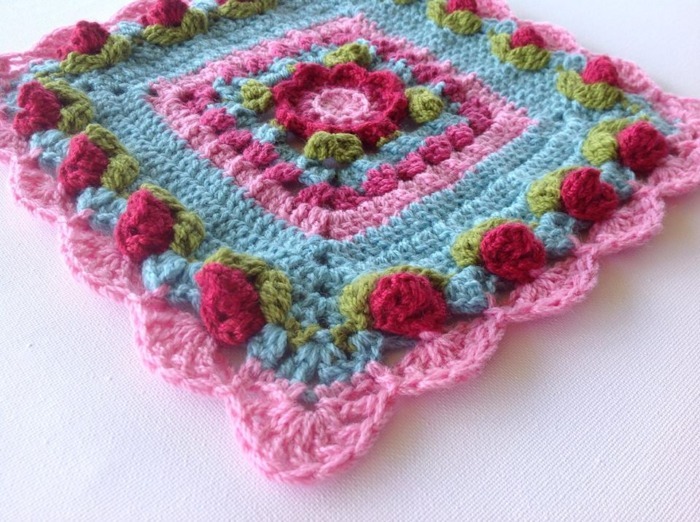 If you choose to use this square for an afghan, I suggest using Babylove Brand’s Celtic Lace Join to join the squares to each other. The ‘Flowers for Lydia’ square below was made by Maggie Bullock. Maggie has also done an amazingly detailed CAL that teaches you how to read charts if you don’t already know. You can find the ‘I Can Read Charts’ CAL HERE. If you do make this square, please share some photos using #flowersforlydia. I would love to see it made in different colours! is thee anyway I can get this translated in dutch? 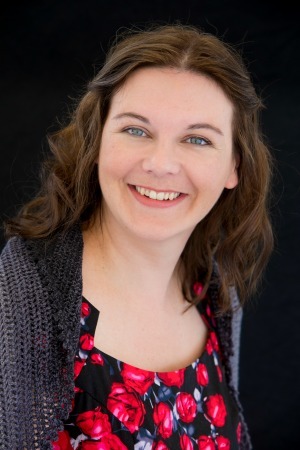 Hi Magriet. Thank you! Unfortunately, this pattern is not available in Dutch. I love this square! 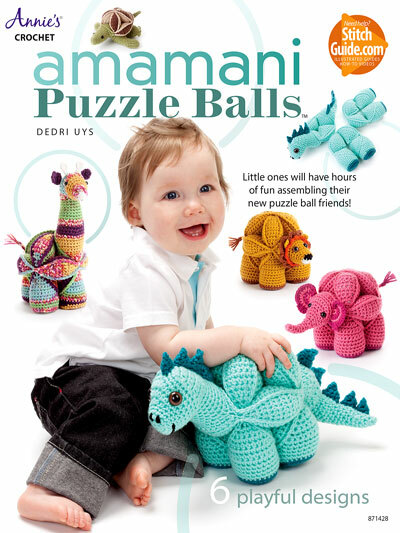 question- I want to make a pillow for mother’s day and so my square needs to be about 19 or 20 inches. any idea how many times I could repeat the blue and pink rounds right after the flower to increase the size? Hi Cynthia. I wish I could give you a definitive answer, but it would depend so much on the yarn you use, the hook you use, and your personal tension. If you make it and tell me how large the central square and the border is, I might be able to help you work it out. Thank you :) I hope your eyes aren’t squeaking too much from all the pink! 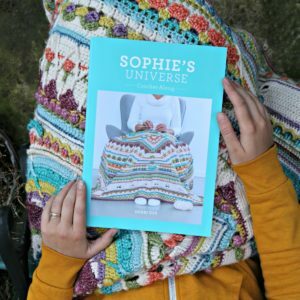 I have been looking through your site, page after page :) I really wish I could join you on the reserve in September, but I am too young and too far away :( By the way, I was wondering if you could do maybe a tutorial on how to dye yarn? because I have this really ugly neon yellow that I got from a kit a few years ago, and would like to turn it into a beautiful color that I can use for a bag or something! Thank you! Hi Twix. I am not sure why you are too young to go on a retreat? How young are you?? And what kind of yarn are you hoping to dye? Is it wool (which is dyeable) or acrylic (which isn’t)? love this border. works so well. Hi Carmen :) I have always wanted to try that join.